All Combat Veterans returned home from war changed to some degree, if nothing more than the hard earned realization that war is a horrendous exploitation of the human spirit. Combat Veterans experienced and coped in the expeditionary environment with various forms of adrenaline, fear, stress, and danger. For so many Combat Veterans, their war experiences stood in sharp contrast to the Christian values and norms of society in which they were raised. Many Combat Veterans returned home from war, consciously unprepared to emerge fully back into a society conducting normal peacetime daily routines, while others felt unable to share their combat infliction with family or friends not encumbered or exposed to similar experiences. The purpose of our Combat Veterans Support Groups are to provide Combat Veterans a safe venue to establish comradeship with other Combat Veterans, a forum for sharing combat experiences; to provide an avenue to facilitate the easing of internal pain lingering in the recesses of combat memories harbored from family and non-Combat Veterans, and to provide an open protective environment for Combat Veterans to verbalize any issue weighing heavy on their hearts with other Combat Veterans in a Christian setting without fear of recrimination or reprisal. With the conclusion of America’s hostilities in Iraq and Afghanistan, as well as the significant scheduled manpower reductions in the U.S. Armed Forces, there will be a dynamic need for new Veteran organizations that focus solely on the support and care of thousands of discharged Combat Veterans who exhibit PTSD symptoms, are unable to adjust to the civilian society, or only able to communicate their combat experiences and service to other Combat Veterans. 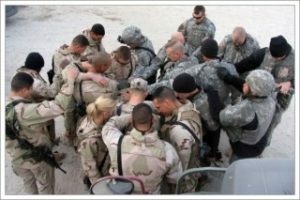 Project Josiah will continue its successful program and expand to other Churches, effectively providing Combat Veterans a new unique platform under Biblical Christian principal that will enable the Combat Veteran to reintegrate whole back into society.